I am spending all of my summer months working on the riddles of the Anglo-Saxon Exeter Book, or as Craig Williamson calls them: the feast of riddle-song creatures. When people ask me what my dissertation is about (a dangerous question) I’m always struggling with and reworking, twisting and turning into shape, a good definition of exactly just what an Anglo-Saxon riddle is. An early editor of the riddles, Frederick Tupper, described riddles as metaphoric: for ‘not only are metaphors the germs of riddles, but enigmatic elements appear in all metaphors.’ While John D. Niles offers us this scholarly definition: ‘In essence the art of riddling is the art of deceptive speech. Here […] the thing or object whose name is to be guessed speaks in its own voice. The speaker-subject tries to disguise its identity not through the usual human stratagems of silence or lies, but rather through the artful use of metaphor and other forms of deliberate ambiguity.’ But again and again, I ask how I might rephrase these definitions to come up with my own independent answer. 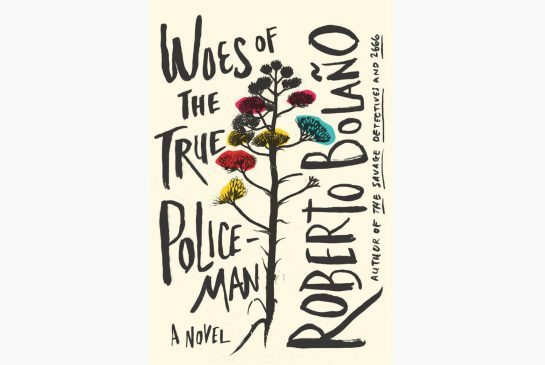 What Bolaño’s School of Hidden Words reminds us, is that the riddles -even when they are silently enclosed between the boards of a manuscript – are an exchange between two people (made present in the invocation of coded words & language). There is always a tricksy riddler made invisible by the manuscript pages, and a de-riddler goaded and provoked by the formulaic challenge of the riddle’s close: ‘Say what I am called.’ In Bolaño’s version the audience member is given an unexpectedly active role (they hold the unknown objects), and similarly the Old English riddles often trick the reader & listener into making objects, things and creatures speak: ‘Tell me how this ring came to speak before the people’ one riddle asks, and we can’t help but feel that we have, unwittingly, animated the ring with our own voices, making it speak anew. Then covered with a cloth the puffed-up creature. …is not an unexpected innuendo, but clearly the bread dough left to rise by the lovely lady, of course (it couldn’t be clearer). The unexpected channels always seem clear once we know the solution. Bolaño goes on to remind us that this is ‘not a matter of judging by appearances;’ even when a series of material objects seem to appear right before our eyes (a tie, a dress, a necklace; a weapon, a songbird, an ageing woman) we are required to establish a correlation, a continuity between these visible objects and the hidden solutions. Wondrous is this world, incomparable Its trappings and adornments. And in a house I watch a strange thing singing. And unearthly is this creature’s shape. Her feet and talons bristle upward. A bite of food or drink will pass her lips. Sly, ambitious, yearned-for, she keeps her mouth shut. 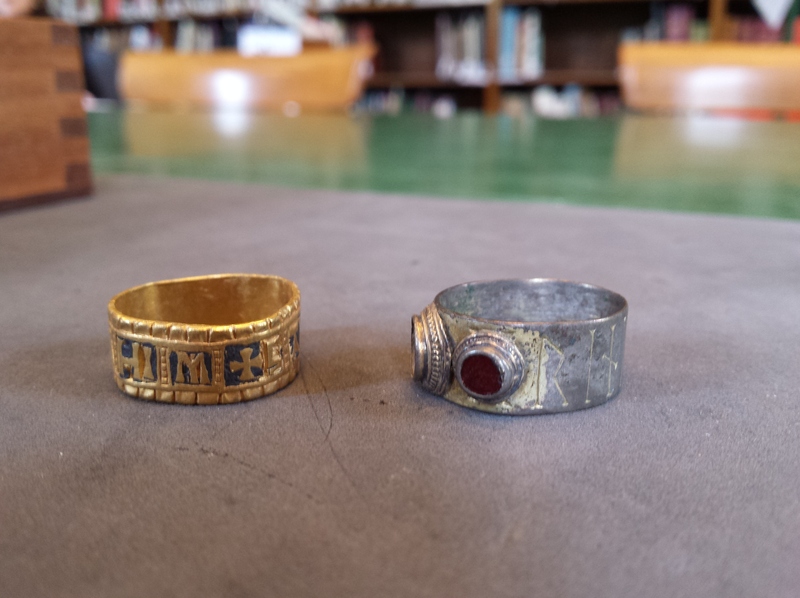 Strange it is – that jeweled foot singing! What manner of creature is she? Leave your solutions in the comments if you like. And if you would like to read more about the riddles pick up The Word Exchange: Anglo-Saxon Poems in Translation [edited by Greg Delanty and Michael Matto] or have a look at this fabulous pun of a blog, The Riddle Ages for commentaries on each of the riddles. 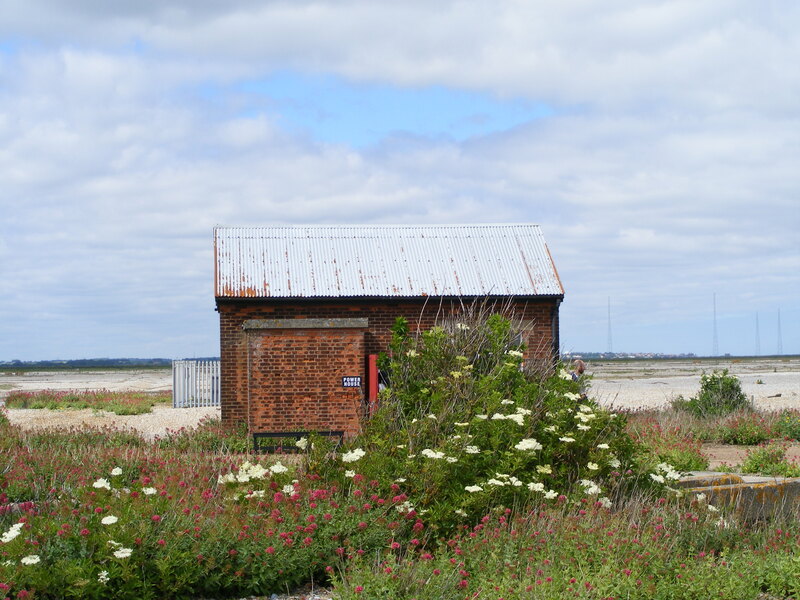 On Saturday I headed out to the Suffolk Coast on my first adventure for the wonderful online journal The Learned Pig. The Pig, with one interest for each of it’s legs, spans poetic subjects across art, thinking, nature and writing. My three trains to the (surely Saxon?!) 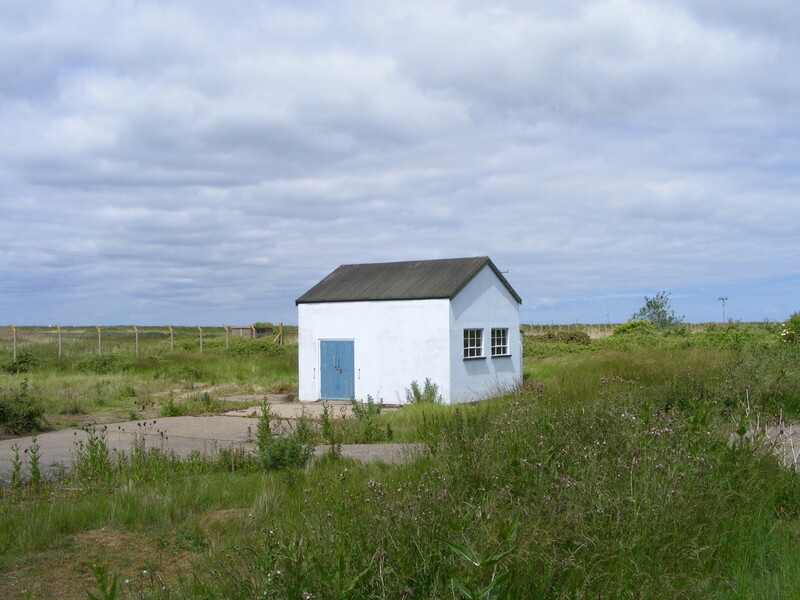 Saxmundham, a single taxi to the Snape Maltings, a minibus to Orford, and then a ferry ride – all led me to Orford Ness for Anya Gallaccio SNAP commission as part of the Aldeburgh Festival. 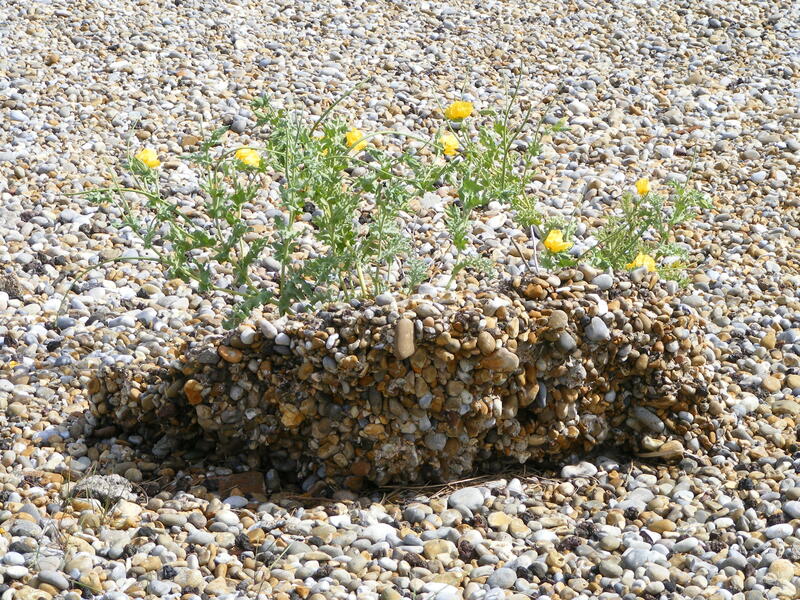 You can read my piece on Gallaccio’s installations and the enchanting, fragile ecology of surreal Orford Ness here, in the Story of a Single Rock. 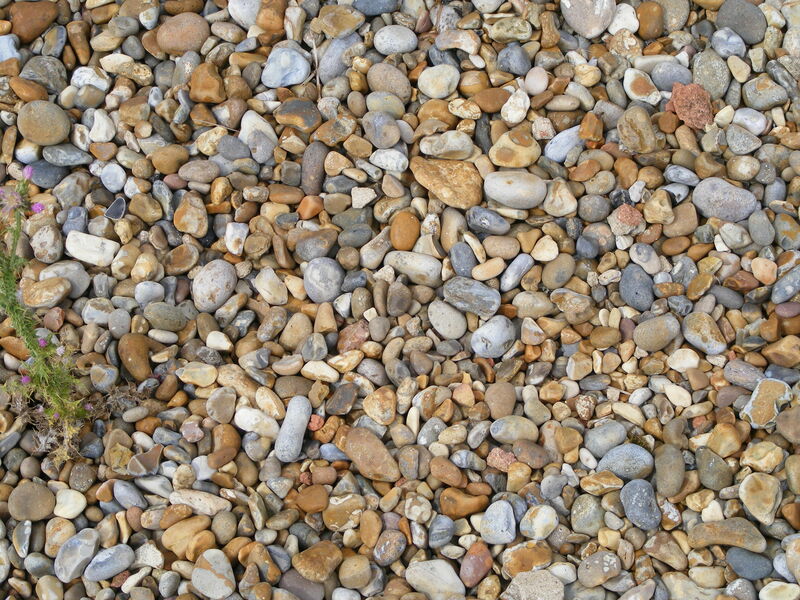 ‘Like many stories, this one begins with a rock, in fact one rock amongst many: the shifting shingle which geographically defines and continually redefines the salt marshes of Orford Ness. When contemporary artist Anya Gallaccio made her first trip to the shingle spit of the Ness, it was not the accidental sculptures of wire and curled sheet metal (rusted by salt-winds) which captured her imagination, but the stony beach desert on which they lie, abandoned like military driftwood. So it’s dissertation season (a little like silly season but with more quiet reflection time) and I’m currently researching, reading, thinking and putting off the inevitable moment at which I begin setting words to paper. I’m at that frightening, but also quite satisfying stage, at which everything in my life slowly weaves its way back to being ‘about my dissertation;’ where all connections lead in a single, focused direction and I find myself impossibly entangled in my research. So I’ve decided to record a few of these tangled threads informally here. I’m currently being sucked into the sound-vacuum of a broad range of texts, studies and collections on sound theory. I’m reading without a clear sense of where all this theory is leading me, but its beginning to attune me to a number of things I was once deaf to. Sound is emerging as an increasingly significant element in my own sensory landscape. So here are a series of anecdotes which I hope illuminate some of the ideas I’m currently processing about sound. I should point out that lots of these ideas seem fairly obvious and yet are, ironically, muted and unarticulated in a lot of discourse. I live in a small, quiet village of around two thousand people and the natural soundscape is one punctuated by the soft swell and drift of cars, birdsong, neighbours’ children bouncing basketballs or jumping on trampolines, and the innocuous and temporary sounds of summer lawn-mowing and strimming. 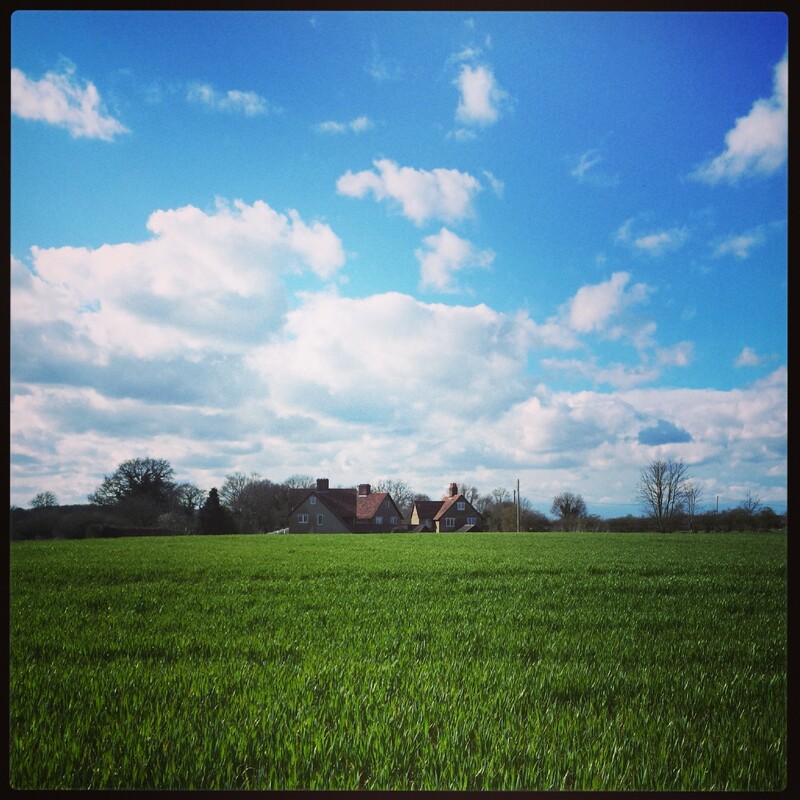 A sonic collection of subtle and reasonably non-intrusive village sounds. Recently this soundscape has been completely transformed by the development of a skip-yard over the road into a noisy, dirty, disruptive waste processing site and wood-chipping yard. Lounging around in the garden is now the aural equivalent of being on an industrial site. Surrounded by the punctures of bleep-bleep reversing vehicles, the roar and stutter of forty tonne lorries, and the steady and perpetual drone of heavy machinery; it is only now that I understand how important that village soundscape was in shaping, soothing and soundtracking our daily lives. But the most interesting thing about living amidst all this new noise is the confirmation that we don’t just ‘hear’ with our ears. As philosopher Don Ihde reminds us: ‘while ears are the focal point of hearing one listens with his whole body.’ ‘One apparent paradox of hearing is that it strikes us as at once intensely corporeal – sound literally moves, shakes, and touches us – and mysteriously immaterial,’ writes Steven Connor in an essay entitled ‘Edison’s Teeth: Touching, Hearing.’ The corporeality of sound and its embodiment in beings and things is also something which has been preoccupying me a great deal. The most unbearable of all the combined industrial noises is the sound of the wood-chipper: a noise which can neither be drowned out by the overlay of sweeter, louder melodies nor escaped by retreating to the sealed-up confines of the house. Even when we choose not to listen with our ears – desperately seeking to blot it out – this sound works its way through our bodies as though all our skin, limbs and bones were sensory organs and sound receptacles. It’s a kind of reverberation which travels through the ground and through the walls: one which it is impossible to stop ‘hearing’. It rattles my mum’s nerves and gives her the shakes and so we are launching a battle against the noise (and have so far successfully recruited a so-called ‘noise-man’ from the council to our case) and sound becomes the hottest topic in our household. 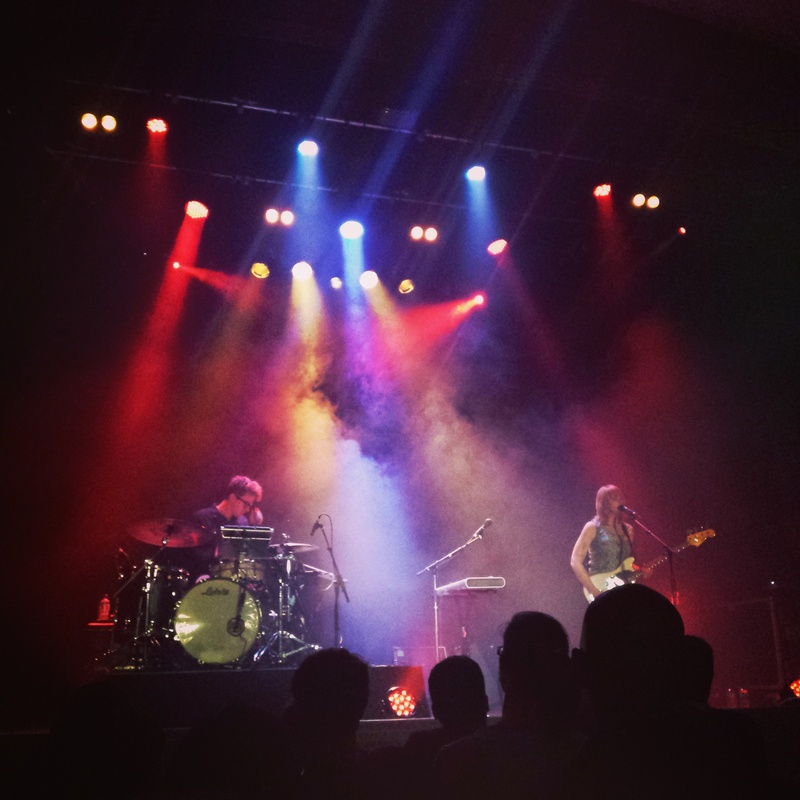 The other night I was standing amongst the crowds at a gig in the Islington Assembly Hall forgetting the nightmarish noise back home, and tuning in to the pleasurable sounds of Wye Oak. Suddenly I was slowly and sensuously enjoying the experience of hearing with my whole body; remembering that totally immersive soundscapes can also be pleasurable. I stood feeling the vibrations in my belly, feeling them rippling across my skin, and I gave myself over to my auditory senses. Then gradually I started to realise that my hearing body was reacting in different ways to the sounds pulsing through it. Despite being a terrible dancer the music touched me in such a way that I couldn’t help moving with it: my feet, my legs, my hips, even my shoulders and my neck and my head. It felt wonderful to let my body go with the rhythms, to let it do what it wanted as though my mind was now a separate entity that had little control over its movements. There was no ‘language’ involved in the way I was moving and yet it felt like I was communicating. The most interesting effect of the music (aside from the emotional wellings and bursts of joy and sadness) was the desire to begin making my own auditory effusions. When I’m listening to music alone I like to join in, even though I am not a gifted singer: touching my own voice with the voice of the artist in a peculiarly and satisfyingly tactile way. I didn’t want to sing along at the gig because I wanted to focus all my energies on ‘listening’ but when the songs finished I whooped as loudly as I could and then leaned in to whisper to my friend: these over-excited effusions of praise and awe which I couldn’t help but let escape. Interestingly enough as I write this in the British Library there are academics all around me who can’t help but let out sighs, exclamations and laughs – auditory releases in the silence of concentrated study. Perhaps sound has a greater emotional and communicative power than I have ever given it credit for. Sound divorced from language, still speaks to us in significant ways. And yet I was struck by the extent to which even this seemingly visual, silent language, ‘the emphatic silent vocabulary of the body’ as David Wright describes it, was accompanied by so many effusive sounds which escaped even without these men being consciously aware. I listened to the dry clickings of the tongue touching the roof of the mouth – in a kind of phantasm of audible speech – and heard the hands making their own communicable sounds as skin brushed against skin and fingers clapped and clicked together. Both voices and gestures are felt in the body with a similar resonance, echo or reverberation: our bodies feel both silent visual languages and audible speech as we enact them, or cognitively process these sensory experiences. I also thought of Don Ihde’s theories about the ‘auditory imagination,’ which suggest that silence is never silence because much of our thinking is ‘linguistic;’ a kind of ‘inner speech’ in which language is sounded out in our heads. 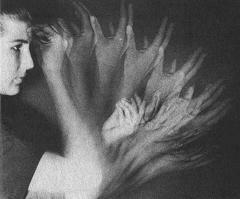 Do people who were born deaf have a sense of their own ‘self-resonance,’ of the unique sound of their individual voices? Do they hear their own rhythms and melodies as a kind of inner-music? Do their ‘auditory imaginations’ give the world a new set of imagined voices and imagined sounds, or is auditory imagination impossible for the congenitally deaf? As we pulled into Tottenham Hale an announcement was made over the PA that the train would now be terminating at this station due to its late running. I began to pack away my things and one of the men gestured to me to ask if I was getting off. I nodded and he politely moved over to another seat so I could get out. And then I realised that I couldn’t just leave them there ignorant of the announcement which the rest of the train had happily heard. I had seen the one man order a red-bull from the drinks trolley earlier by typing his request down on his phone, so I got my own phone out and typed ‘This train is now terminating at Tottenham Hale’ and passed it over for the other man to read. There were smiles and thank yous exchanged. This experience gave me an incredible amount of pleasure, I couldn’t help smiling to myself. Ultimately I think it was so satisfying because despite the seeming barriers in our communication (despite the time I spent feeling left out and adrift, locked out by their language), we had found a way to speak to each other and realised that we did share language after all; all language is a drawing and sculpting of words in space even if we do it with different sensory perceptions. 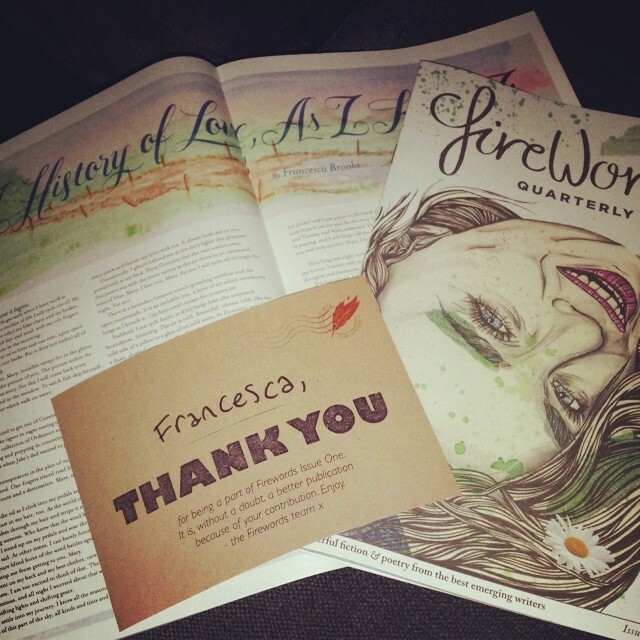 I came home from my holiday in Spain yesterday to find my first short story in print in the beautifully designed Firewords Quarterly: what excellent joy! This is the inaugural issue of the new literary magazine which has a strong focus on aesthetics and design, with each story being paired with illustrations from a different designer and illustrator. The issue is absolutely beautiful and filled with lots of little literary treasures and poetic morsels. I am very proud to have been a part of the magazine and hope that I might be able to contribute again in the future. My short story, A History of Love as I know it, is inspired by a family legend about my great grandfather cycling from Coventry to Bourton-on-the-Water on the weekends during his courtship of my great grandmother. It is a very personal story for me, which remains close to my heart, so it is particularly special to finally see it in print. The story was hand lettered by the artist Terence Tang, with a watercolour by Jen Tang – which has just made the experience all the more wonderful. The cherry on top of the print cake! Thank you Firewords.